Vanesa is a clean and elegant blogger themes, with a big focus on your content. With a ton of different features and a multitude of ways to showcase your posts. 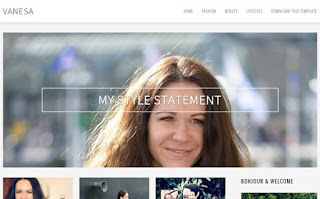 Vanesa blogger template is having a advantage of latest technology, big screens, and touch features. All the elements are big, with big margins to make them work on touch and look great across all screen sizes. Clear section structure makes it easy to find and differentiate the elements. Vanesa free blogger templates is perfect for anyone who needs their blog to stand out.